"Are the worms for fishing?" 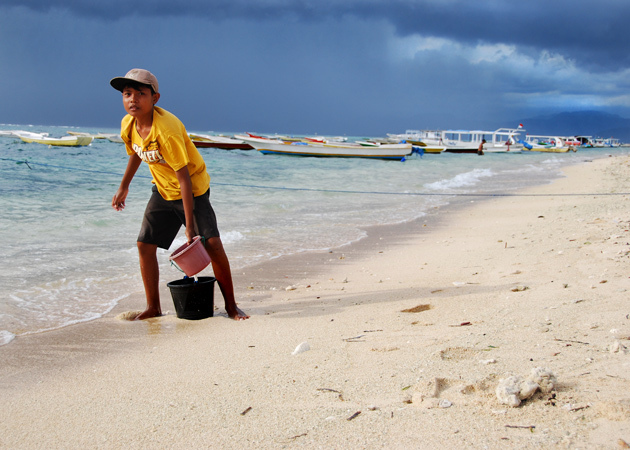 "They're for eating," replies Gede, a waiter in a restaurant overlooking the long white beach at Jungut Batu, Nusa Lembongan. 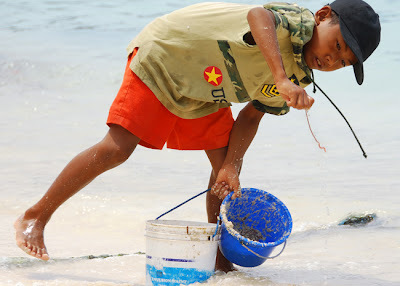 Bare-footed and bent double, children pluck worms (cacing laut) from the wet sand at the shoreline. 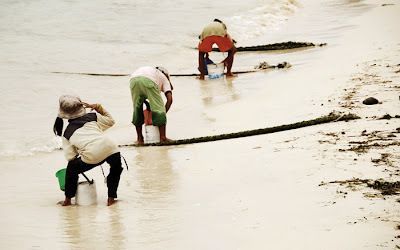 They carry two small buckets in one hand: one for the collected worms, and one with water which they sprinkle onto the sand after the waves recede. The second the water droplets hit the sand, the underground worms breach the surface. The eyes and hands of the children are predator-quick, locating and whipping out the slim worms faster than I could see. The worms can be sold as fishing bait for Rp 1,000 ($0.10) per kilo. "The worms are for eating" -- that's what you always want to hear from your waiter.